Beth & Cory's Mom: Get Your Ears Ready! Sync 2019 Starts on April 25th! Get Your Ears Ready! Sync 2019 Starts on April 25th! It's almost time for another summer of free audiobooks from Sync! Yes, they're specifically directed at teens, but I've been enjoying them for several years, too. I check out YA books from the library, too. 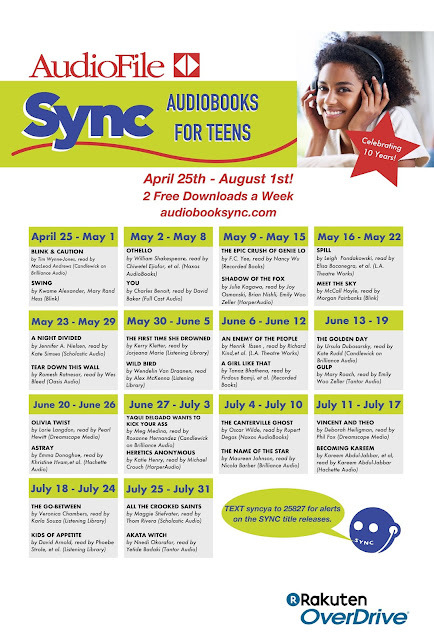 Every weekSync gives away two free audiobooks in themed pairs, often a current book paired with a classic. The program is a great way to get exposure to many different types of books. And audiobooks make it possible to read and do other things at the same time! Unlike library books, these audiobooks are yours to keep, but you'll only have one week to download each pair. So be sure you have Overdrive on your computer so you'll be ready to start downloading. And sign up for email alerts or text syncya to 25827 to receive text alerts about all the featured titles.